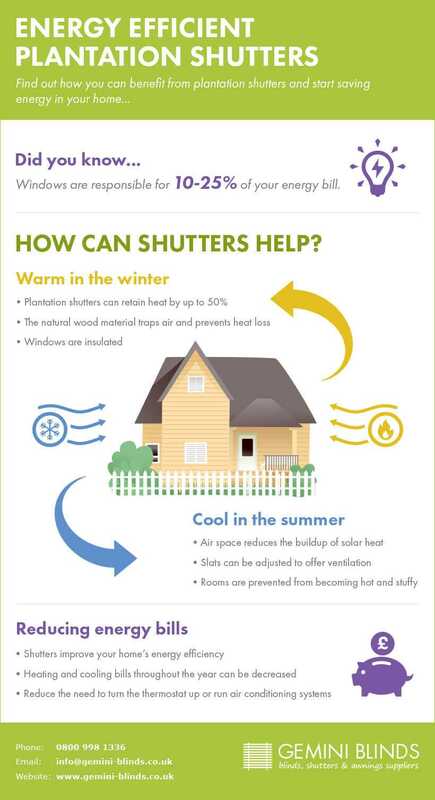 A recent survey by Edinburgh World Heritage Trust has unearthed some astonishing facts, and illustrated how interior plantation shutters can dramatically reduce your energy bill. The Trust used thermal imaging cameras to monitor heat loss, and windows that were covered lost far less heat than those that were not. Up to 18% of your home’s heat is lost through the windows, and if you have old single glazed windows, this can be considerably more. The unique construction of plantation shutters acts like double glazing and the natural insulating properties of the wood traps air and prevents heat loss. This works in reverse during summer months when shutters reduce the amount of direct sunlight entering a room and lower the need for air conditioning and fans – all of which burn energy and cost you money. Glass is a cold material and doesn’t retain heat well, so if your windows are poorly fitted or uncovered, they can act as a direct conduit that channels the heat from your home on to the street. You can stop this from happening in a number of ways, thus cutting the cost of fuel in winter – and of course air conditioning in the summer. Plantation shutters made from wood are warm and attractive, and they create a good barrier that allows you to keep your heat right where you want it – in your home. Don’t Curtains do the Same Job? Plantation shutters can be made from natural wood and provide you with a thicker barrier than fabric. Also, in winter condensation can be a problem when curtains are closed. This is because the cold glass is suddenly blocked off and the resulting pocket of air heats up and condenses causing mould and damp. Plantation shutters have slats which allow air to circulate. This prevents condensation from forming and ensures that the construction of your home remains clean, dry and undamaged. During hotter periods of the year, plantation shutters offer shade and allow you to leave windows open without loss of privacy. Not only are interior shutters a great way to cut fuel consumption, they are an elegant addition to any room. Plantation shutters are available in dozens of stylish designs and can be tailored to match or contrast with your decor. Choose natural wood finish for a rustic style room or pick clean, gleaming white or bright colours for contemporary homes. The options are endless, but whatever type of plantation shutters you choose, you will certainly reduce your energy bill and enjoy a healthy, well ventilated home! Gemini Blinds are the leading providers of plantation shutters and blinds in the North West. Our friendly and experienced team are on hand to provide free home surveys to assess your options and measure your window recess, ensuring that your blind or shutter fits perfectly. Get in touch today for more information.